Next session starts Fall 2017! This course is designed to introduce the framework of critical care patient management to paramedics and other health care personnel who need to provide practical and effective care to the fragile patient. 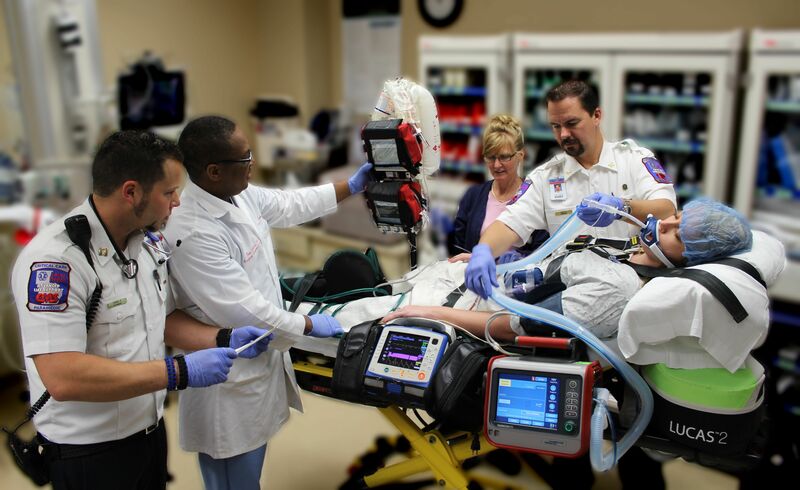 This intensive course is provided by EMS providers with years of critical care experience in both the ground and aeromedical environment as well as expert Physicians and other advanced practice providers. Lecture focuses on developing an understanding of advanced pathophysiology, diagnostics, pharmacodynamics, advanced ventilator management, hemodynamic monitoring, management of an intra-aortic balloon pump, ECMO, tertiary ICU level evidence based practices, and keen awareness of the dynamic nature of advanced patient management. Students will apply the didactic information during simulation in HCMC’s state of the art simulation center. Hands on practical skills will be developed through procedural skill labs. Skills the students will perform are chest tube insertion, central line insertion, arterial line insertion, hemodynamic pressure monitoring, pericardiocentesis, escharotomy, ultrasound, and surgical airway placement. For more information please contact HCMC EMS Education at (612) 873-5681 or ems.ed@hcmc.org. Lakes Regions EMS provides a number of education programs for the layperson, professional rescuers, and healthcare providers. Serving our customers with the state of the art patient care, outstanding customer service, dedication to the communities we serve and financial health and responsibility. ©2019 Lakes Region EMS. All rights reserved.